An eye occlusion is a blockage in one of the arteries or veins supplying blood to the retina and/or optic nerve. These blockages can cause severe and sudden vision loss. Contact your eye care professional immediately if you experience sudden vision loss, and follow up right away with your family doctor. Eye occlusions often signal other serious health problems requiring immediate medical attention. Branch Retinal Artery Occlusion or “BRAO”— Characterized by a sudden loss of peripheral vision, and occasionally central vision, from a broken clot or plaque traveling from the carotid (in the neck) artery into the branch retinal artery. Rapid treatment (within 12-24 hours of the onset of symptoms) with glaucoma medicine can help. 80% of patients with a BRAO can recover up to 20/40 in visual acuity. Branch retinal vein occlusion or “BRVO”— Involves distorted and diminished vision, peripheral vision loss, and blind spots in one eye. This type of occlusion usually occurs in people with diabetes or high blood pressure. 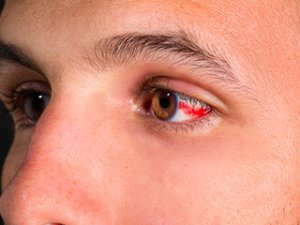 Your eye care professional will diagnose the condition based on retinal bleeding along one of the retinal veins, which is detected during a fluorescein angiogram test. Laser and pharmaceutical treatments can help some patients recover a degree of their lost vision. Central retinal artery occlusion or “CRAO”— Manifests as painless, yet extensive and sudden vision loss in one eye and can point toward serious narrowing of the carotid artery or complications of diabetes. Immediate, full medical and eye exams are necessary to address the root cause. Vision loss is often permanent, with only a few therapies offering limited success at restoring some vision. Treatments must be implemented within a very short time frame after the onset of symptoms to have a chance of success. Central retinal vein occlusion or "CRVO"— Diabetes and high blood pressure are risk factors for CRVO, which can cause mild to severe vision loss. Laser and pharmaceutical treatments can stop the damage and prevent worsening vision if caught early. Any sudden vision loss, whether painful or painless, requires immediate attention because prompt treatment offers better vision outcomes in the case of eye occlusions. Also remember to check in with your physician for diagnosis and treatment of other potentially serious eye occlusion risk factors.